Last week’s IMF conference on Monetary Policy in the New Normal revealed a lot of disagreement on the key issue of where policy should be headed in the future. A dispute that broke out between me and Adair Turner is one example. I led off the first panel making the case that central banks should re-normalize rather than new-normalize monetary policy. At a later panel Turner, who headed the UK Financial Services Authority during the financial crisis, “very strongly” disagreed. Turner took issue with the view that a departure from predicable rules-based policy has been a big factor in our recent poor economic performance, essentially reversing the move to more predictable rules-based policy which led to good performance during the Great Moderation. I used the following diagram (slide 5 from my presentation), which is an updated version of a diagram Ben Bernanke presented in a paper ten years ago. 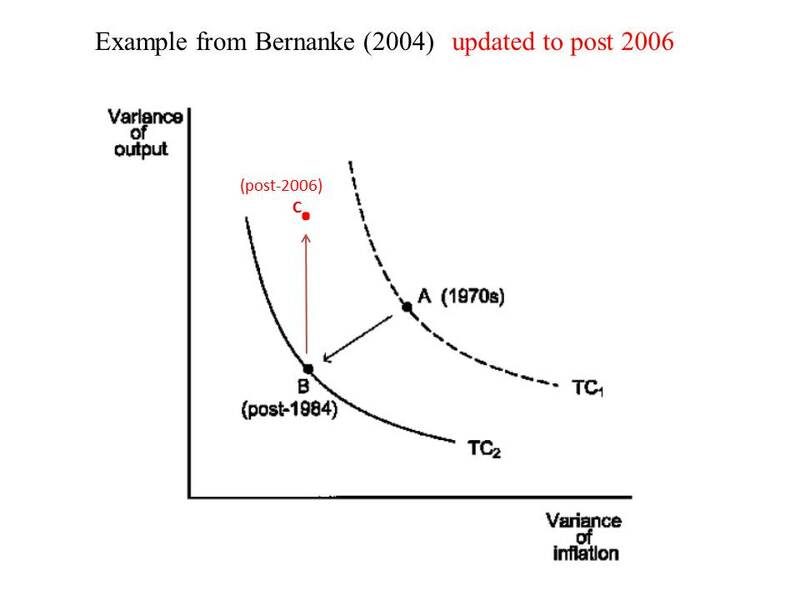 The diagram shows a policy tradeoff curve (called the Taylor Curve by Bernanke in his paper following fairly common usage). I argued, as did Bernanke in that paper, that the improved performance from point A to point B was mainly due to monetary policy, not a shift in the curve. In my view, the recent deterioration in performance to the red dot at point C was also due to a departure from rules based policy, rather than a shift in the curve. But as I showed in my presentation (23.30-38.00 min) and in the written paper, monetary policy did not stick to those rules. The Fed deviated from its Great Moderation rules by holding interest rates too low for too long in 2003-05 thereby creating that “buildup of risks in our financial sector that produced the financial crisis of 2008” as Turner puts it. In addition, financial regulators and supervisors set aside safety and soundness rules. And in the post-panic period monetary policy has been anything but rule-like and predictable. 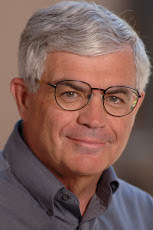 Turner is also incorrect to suggest that the simple rules in question, such as the Taylor rule, are so simple that react only the rate of inflation. They respond to developments in the real economy too. If the IMF conference and other events last week are any guide, this debate is heating up. At one extreme Adam Posen argued at the IMF conference for Quantitative Easing Forever, but Jeremy Stein, Brian Sack, and Paul Tucker were skeptical. 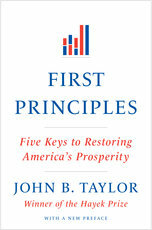 And at her speech in New York last week Janet Yellen referred to the Taylor rule, and some commentators here and here saw signs of laying the ground for a return to more rules-based policies.